Choosing to study abroad in Melbourne, Australia may be a perfect option for creative types who have always wanted to explore the land down under. Or really anyone looking for excitement and fun! That’s because Melbourne is the fastest growing capital city in Australia and home to a vibrant culture. International students could find plenty of ways to enjoy the year-round temperate weather while pursuing their studies. Sporting events, concerts, open squares, parks, gardens, museums, and so much more can be found throughout the city. Plus, Melbourne is Australia’s most diverse city, with people from more than 200 countries calling the city home. You could get a sampling of cultures from around the world, just by walking around your new neighborhood! But diversity and fun activities are just two of the many reasons why you should study abroad in Melbourne. There’s also, of course, your studies. Many students may enjoy taking courses in art, architecture, linguistics, and history in the city. That’s because, both inside and out of the classroom, Melbourne offers an array of ways for you to learn about those subjects firsthand. Plus, since your classes will likely be taught in English, you might not have to miss a step in your academics. Continue reading to find out more why choosing to study abroad in Melbourne may be a perfect option for you. Then, click on any of the sponsored listings on this page to learn more about individual programs to find the perfect match for you! One of the best reasons to study in Melbourne is the fact that your professors and classmates will more than likely speak English. That means you may not even need to learn a new language to study abroad! But Melbourne is also one of the most welcoming cities for international students, with a number of internationally recognized universities. In fact, roughly 30% of the students in the city are from abroad. The city as a whole wants to make sure you feel comfortable as soon as you arrive. That’s why they’ve built a Study Melbourne Welcome Desk, located inside of the airport, to answer any of your questions and help find transportation to your new home. There’s also a Study Melbourne Student Centre in the business district of Melbourne to help guide you through the city. That way you won’t miss out on all the fun that could be had! Excited about studying in Melbourne? Continue reading to find out what you should study while you’re there and then click on any of the sponsored listings on this page to find the perfect study abroad program for you! As the second largest city in Australia, Melbourne is an international destination, which makes it a melting pot bursting with creative influences from around the world. Therefore, some of the most popular programs to study in Melbourne are art and music, architecture, literature and linguistics, and history. Melbourne is considered the birthplace of Australian film and impressionist art. Plus, it’s the one of the live music capitals of the world, with more than 62,000 live concerts every year, which are just some of the reasons art and music are such popular courses to study in Melbourne. Art and music includes many different topics, such as visual arts, production, theater, and more, so you may have many options to choose perfect courses for you. These courses, especially in art, may focus on self-reflective studio practice to instill the self-confidence needed to be an artist. So, Melbourne may just be the place you’re looking for to get your creative juices flowing! Other types of courses and programs that take advantage of the creativity throughout Melbourne are literature and linguistics. Melbourne and its citizens borrow more books from Melbourne’s libraries than anywhere else in Australia, which is one of the reasons the city was named a City of Literature in 2008. Melbourne is also home to a number of famous authors, including Thomas Browne, and hosts many writing festivals throughout the year, including the Melbourne Writers Festival and Melbourne’s Emerging Writers’ Festival. This type of enthusiasm for literature and linguistics may make the city a perfect place for you to study human language in all of its aspects. At first glance, you may think Australia wouldn’t be the place to study history. After all, the English arrived for the first time in 1788, many years after even the Americas were colonized. But that’s really only a portion of the great history of Australia. The indigenous cultures of Australia, the Aboriginals and the Torres Strait Islander people, are some of the oldest cultures in the world. They are at least 50,000 years old, though some experts claim they may be closer to 65,000 years old. Though there weren’t always great relations between these cultures and the Australians, they have improved over the years. Now, every year on May 27th, Australia celebrates Reconciliation Week, which is the anniversary of when Australia voted to include these people in the national census. With these ancient cultures ingrained into Australian society, Melbourne may provide a unique opportunity for you to study how man has changed, adapted, and evolved over thousands of years. Plus, throughout the city, there are museums where you may learn about the Aboriginal history, the first settlers, and the gold rush of the 1850’s. If you choose to study history in Melbourne, the many museums may enhance your studies by giving you experiences outside of the classroom to develop an in-depth knowledge about how Melbourne’s history. The architecture of Melbourne has been greatly influence by the history of the city and the country. For the first 26 years of Australia’s history (1901 – 1927), Melbourne was the capital. But the long-standing (and continued) rivalry with Sydney forced them to comprise that neither would be named the capital city. This rivalry, which Melbourne and its citizens take very seriously, has helped influence some of the unique spaces, parks, and events throughout the city. This has led to historic, classic buildings, such as Athenaeum Theatre and the Donkey Wheel House standing besides contemporary, modern counterparts, such as Australian Centre for Contemporary Art and the Crown Entertainment Complex. Seeing these amazing structures first hand is just one of the reasons why Melbourne is a great place to study architecture. To find an architecture program to study abroad in Melbourne and learn more, browse the sponsored listings on this page and request more information from specific programs. Melbourne is the capital city of the Australian state of Victoria, which is located in the southeast of Australia. While the weather can change abruptly in the spring and the fall, summer (December to February) highs typically reach 85 degrees. This provides Melbourne with a great climate to enjoy the outdoors while you study abroad in Melbourne. One of the other benefits of studying in Melbourne, is the tramway system called Yarra Trams (after the Yarra River, which runs through the center of Melbourne). This is the fourth largest tramway system in the world and is the largest system outside of Europe. It’s expanded to this size over the years to accommodate the growing population. This may make it easy for you to get around and explore your new home! Finally, there’s what might be the most important part – the people! 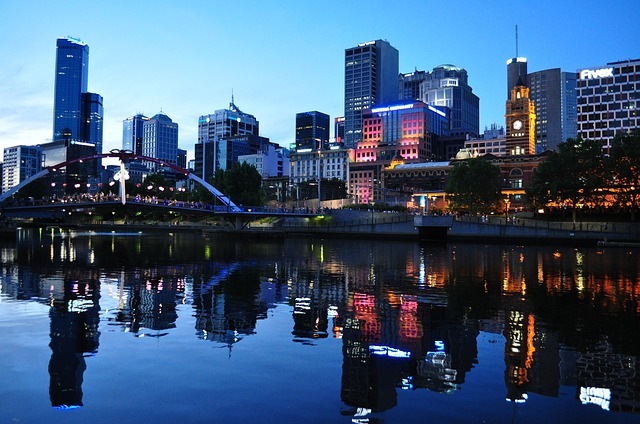 As of June 2015, Melbourne was the second largest city in Australia with 4.53 million people. With an estimated 30,000 international students enrolled in Melbourne schools, you may have other international students in your classes looking to explore the many sights and sounds Melbourne has to offer. And, just like you if you choose to study in Melbourne, they may also be looking to make new acquaintances from around the world. Melbourne is one of the most diverse cities on earth, with more than 200 different countries represented by its population, 230 different languages spoken, and 100 different faiths and religions worshipped. Citizens of Melbourne celebrate that diversity with a range of festivals such as Cultural Diversity Week, the Chinese New Year, and Latin American Fiesta. There’s also an Immigration Museum in the center of the city and steel sculptures and glass panels across the Sandridge Bridge, celebrating all the different cultures that make Melbourne great. This diversity may be the perfect opportunity for you to learn about many different cultures, all without leaving the city! As Melbourne continues to grow, there are plenty of exciting things to fill your time between classes and studying. These include sporting events, markets, and parks and gardens. Sports: One of the most popular sporting events is the Melbourne Cup, a horseracing event similar to the Kentucky Derby in the United States, where fashion meets the track. Plus, the Australian Football League and International Cricket events commonly play at the iconic Melbourne Cricket Ground, affectionately referred to as the “G”. This is the largest stadium in Australia and holds over 100,000 people. Markets: Melbourne is known for its markets, which include arts and crafts, fresh produce, and even fashion. The most famous, and one of the biggest tourist attractions in Melbourne, is the Queen Victoria Market, known simply as the Vic Market to locals. However, there are many other, smaller markets located throughout the city. Most sell a wide variety of products and may give you a feel for the multicultural diversity in Melbourne. Parks and Gardens: Whether you’re looking for a relaxing stroll, want to see southern Australia in all its natural beauty, or just need to break away from the books, there are many parks and gardens located throughout Melbourne. These may allow you the opportunity to enjoy flowers, manicured lawns, ancient elms, fountains, architecture, and Aboriginal history, right in the heart of a city. Take the Next Step to Study Abroad in Melbourne! Ready to learn and grow in an up-and-coming city that is filled with sports, parks, and culture? Click on any of the sponsored listings on this page to learn more about individual programs. This may include program description, admission requirements, and available courses. From there, you can contact the school directly to request more information. When you find the perfect program for you, then you can pack your bags and get ready to study abroad in Melbourne! Just remember to check with your current school to make sure that your credits will transfer and any other details that you may need to know before you leave. The Faculty of Arts alone has more than 400 subjects in 40 departments. Add to that other popular Faculties like Science, Engineering, and Commerce and Economics and the hardest part will be deciding what to take!